Classical pianist and composer from the USSR. Born 4 May 1924 in Brjansk, USSR. Died 22 November 1993 in Santa Monica, USA. Tatiana Nikolaeva began to study music in her early childhood. She took lessons from her mother, a graduate from the Moscow Conservatoire and she was a disciple of Prof. A. B. Goldenweiser, who would also teach to her daughter. Nikolayeva's father was a violin and cello player in the concerts the family arranged at their home. At the age of thirteen, she was admitted, after passing the examination, to the Central Secondary Music School of the Moscow State Conservatoire (Goldenweisers Class). later she went further to the Conservatoire and then she completed her post-graduate course, all under the guidance of Pr. A. B. Goldenweiser. She graduated with an honour diploma and got her name inscribed in the table of honour in 1947 as pianiste under Goldenweiser and in in 1950 as composer under Prof. E. K. Golubev. T. Nikolaeva won the first prize at the 1st International J. S. Bach Competition in Leipzig, in 1950. She went on tours in almost all cities of the Soviet Union and in thirty other countries in the world, including several European and South-American countries, Canada, Australia and New Zealand. She was awarded with the State Prize of the USSR for her concert performance activities and the first piano concerto she had written. Tatiana Nikolaevas repertoire is remarkably huge. A lot of her concert programmes include performances of large musical cycles such as: the 48 preludes and fugues from "The Well-Tempered Clavier", the "Goldberg variations" and the "Art of the Fugue" by Johann Sebastian Bach, the cycle of 32 sonates by Ludwig van Beethoven and the 24 preludes and fugues by Dmitri Shostakovich. Her programmes also include about fifty piano concertos. 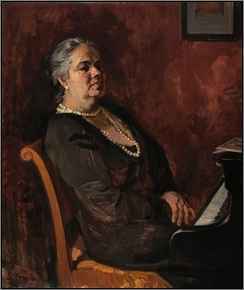 Many works of Soviet composers were performed for the first time by Tatiana Nikolaeva, and many composers dedicated works to her.